How do I change the way dates and times are displayed? Click on the ‘my account’ link in the right top corner of the tool. At the bottom of the window that opens you can change the date and time settings. You can’t yet. We are sorry. We are aware that the used font size is fairly small. It has been a choice between making the schedules as compact as possible to enable the best overview of your project and usability. We do get questions on how to increase the font size on regular basis so we are aware of the problem. It’s on the To Do list to enable the setting of the font size. We found that the text is significantly better readable on Apple’s macs and laptops. You can change the email address that is being used to login yourself. Just click on the ‘my account’ link in the right top corner of the tool after you have logged in and change the email address. To change the payment information please send an email to tom@tomsplanner.com. We will stop the autorenewal of the account and when the account is about to expire the new user will be promted to make a first payment and enter their payment information. If for instance someone else becomes the project manager of one of your projects you can transfer your schedule to the Tom’s Planner account of the new project manager. To do this just click on the ‘my schedules’ button in the toolbar and select the schedule. Then click on the change link in the owner section and follow the instructions. You can select all periods and symbols in your schedule at once and then drag and drop them with your mouse to the new date in one time. To select all periods and symbols at once please press ctrl+a on your keyboard (or cmd+a when you are working on a Mac). This will select all periods and symbols in your chart. To copy/move rows,groups, periods or symbols from one schedule (the source) to another (the destination) select the items you want to copy/move in the schedule that is the source. If you keep the shift or ctrl key pressed on your keyboard while selecting rows/groups with your mouse you can select multiple rows/groups at once. Right click the selection and choose copy from the menu. 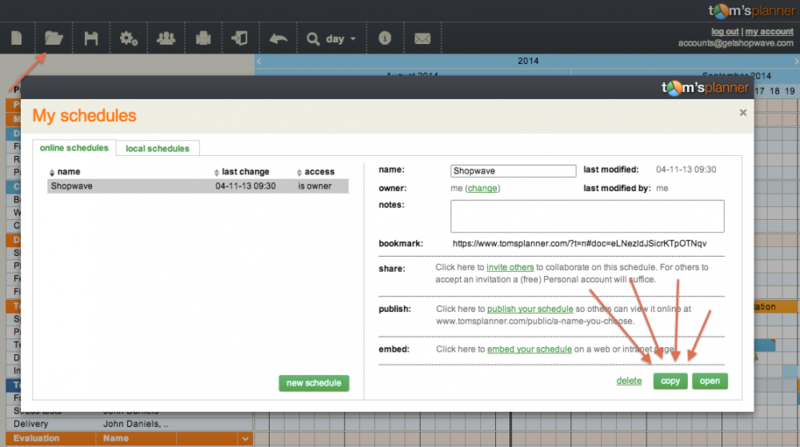 Next open the schedule you would like to paste the copied items into (the destination). The trick is to do this in the same window. So the original schedule (the source) will disappear because the new schedule (the destination schedule) will be opened. Then right click the place you would like to insert the copied elements and choose paste from the menu that appears. The charts in Tom’s Planner don’t have a start or end date. You can scroll to the left or right as much as you like. So there is no way to set a start and end date for a schedule. How ever when you print you can set a date range if you like. This way you can specify the start and end date of the part of the schedule you would like to print.